I'm having trouble getting the vertical deflection adjusted on my monitor when working in 80 column mode with a Viewmaster 80 (installed in a II+, slot 3). The top and bottom text lines extend beyond the physical screen dimensions. There are also faint vertical lines in 40 column mode. Otherwise, the card seems to work. 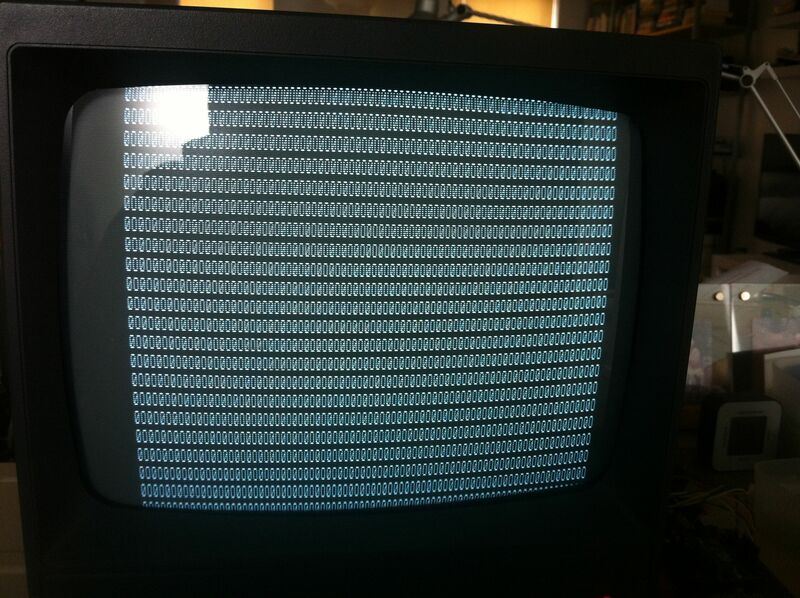 The normal 40 column output from the II+ appears fine. I've seen the deflection issue with two different monitors, but neither are "vintage". Any ideas whether this is a problem with the board itself? 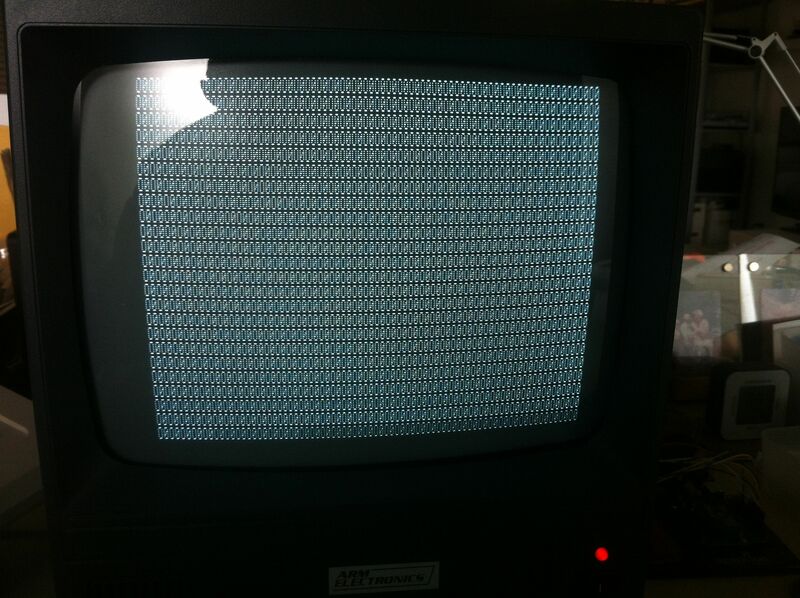 Update: //e enhanced works fine with this monitor in 80 column mode. adjust monitor and call it done. Unfortunately, I don't get much change with the monitor controls, or are you suggesting that I adjust the deflection internally? The 80 column mode inserts an extra odd and even scan line between the rows of text. I don't think this is normal (certainly not compared to the //e in 80 column mode) but I don't have anything to compare it to. Every monitor is different. You might want to entertain the idea of adjusting a potentiometer inside that monitor to get what you are looking for. I figured out my Videomaster 80 column card issue. Like the Videx Ultraterm 80 card, the Viewmaster 80 uses a 6845 CRT controller (CTRC) to generate the timing signals of the display. The 6845 has 16 programmable internal registers and two read-only registers. The programmable registers can be set by writing the register number to $C0B0 and the desired register value in address $C0B1. Mucking around with an oscilloscope and Seleae logic analyzer showed that all of the clock and timing signals were functioning properly in the card, and the output appeared normal other than extending beyond the physical screen dimensions. In all, the extra space I observed between character rows seems to be solely due to the default (power on) value of the R9 register, which sets the overall character height (the font plus extra space). I'd like to burn my own EPROM at some point with these default register values to avoid having to enter them or run this program. I was also impressed by the Videx documentation. They provided firmware code, circuit diagrams and great descriptions of the card operation. The information was much more comprehensive than the AE documentation for the Videomaster card. Nice Trouble Shooting and Write Up!! Where did you locate the Videx Documentation??? videx documentation is a part of the videoterm manual. Yep. The Videx and Viewmaster manuals are on Asimov, Apple2Info.net and / or APPLE2.ORG.ZA. "For the casual user, not much need be said about the firmware that the board comes equipped with... If, however, you enjoy tinkering with register contents and other esoterica, this section will provide you with some very interesting Information." If anyone has the circuit schematics of the Viewmaster card, I haven't been able to find them online. Is there an archive anywhere of Applied Engineering technical info beyond the user manuals? no such doc exists for AE products. Most companies in the early 80s are pretty cool about releasing ROM listings and schematics. AE was not one of them.